Looking for a relaxing holiday, with or without family? Perhaps you should hire a houseboat. Sail around in peace with everything you need for a wonderful holiday. Where would you go to embark on such a holiday? Well, there are plenty of companies ready to lease you their houseboats. Relaxation Boat Hire houseboats allow you to drive their houseboats without any sort of licenses or outside interference. This company helps you set off after a very thorough lesson on how to operate the houseboat - which is apparently very simple, with "a steering wheel and one lever for forward and reverse" according to the company website. The boats available are of different sizes, accommodating from two to ten people depending on which one you go for. 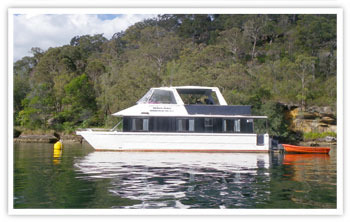 Relaxation Boat Hire also boast a green holiday - allegedly no pollution occurs, as "the lower Hawkesbury and Pittwater are flushed out by the Pacific Ocean twice a day, every day." I must admit, having to bring your own food and everything sounds wonderful until the price comes out - prices start at a whopping $1700 for a deal, but cheaper for day-long holidays such as Australia Day ($650) and the June Long Weekend ($1000). Keep in mind that these cheaper prices are on the small boat which holds 2-4 people. Now I don't know about you, but as an economist in training I personally love the fact that competition exists. As such, the existence of other companies such as Holidays Afloat means that you have options, and there isn't quite as much of a monopoly as one would dread. 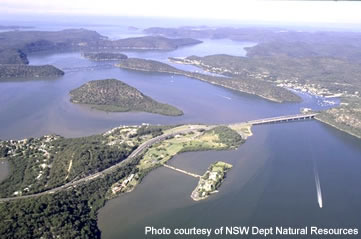 Holidays Afloat suggest that you can go swimming, fishing, relax with a book or even visit secluded beaches and coves. In some cases, the price list seems to be a little more forgiving on the wallet (check mid-week pricing, especially) and there seems to be a large number of boats available for hire. Ripples Houseboats might also be worthy of your attention. Their pricelist seems to be from 2011, but hopefully they will continue to remain the same. I don't by any means think that any of these houseboat holiday prices are cheap at all. I like the sound of Ripples because this company places importance on safety, and not just ease of operation regarding their houseboats. In fact, they boast GPS tracking on every boat. Fuel is charged based on what you use but oil is included in your fees. Houseboats have barbeques and such, but I think I'd be scared of using them in case I set the boat on fire. What would happen then? One benefit of Ripples is that you get four free fishing licenses with every hire. It's up to you, really as to which houseboat company you use. Has anyone had any real experience with this type of holiday? I must admit, I am a little bit curious. Escaping the city on a boat sounds like a delightful dream at this time.